John Joseph Cosgrove was born 20 June 1896 in Granard; his father was a shopkeeper and had been appointed Town Clerk by the time of the 1911 Census. 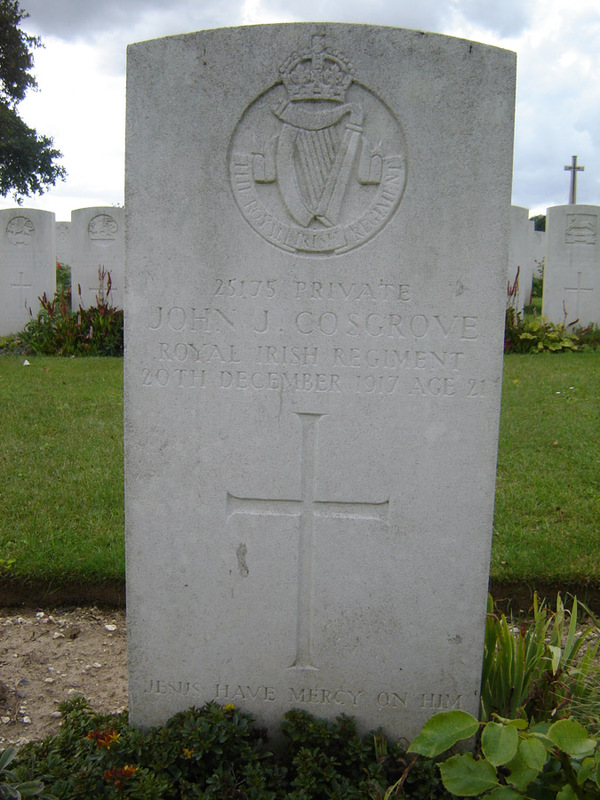 Private Cosgrove served with the Southern Irish Horse (no. 2133), likely sometime after December 1915. He was then transferred to the 7th Royal Irish Regiment, which was formed from the dismounted 1st and 2nd Battalions of the South Irish Horse on 1 September 1917; they joined the 49th Brigade, 16th (Irish) Division in October 1917 and fought in the Third Battle of Ypres. John was injured in battle likely died very shortly after, as he is noted as having died of wounds in some sources, and having been killed in action in others. For the entirety of December 1917, the battalion were in the field, likely near Villers-Foucon (listed as Villers-Foucourt in the regimental diary); there was no notice of any fatalities in the days surrounding the 20 December, but one soldier was noted to have been wounded by heavy shelling on the 16 December. The battalion marched to Tincourt on the 18 December - it should be noted that Tincourt was an important field medical centre at this time, hosting a number of casualty clearing stations and field hospitals. Son of James Cosgrove and Julia (née Kiernan) of Main Street, Granard.